Chloride-conducting ion channels of the ClC family are emerging as critical contributors to a host of biological processes. These polytopic membrane proteins form aqueous pathways through which anions are selectively allowed to pass down their concentration gradients. The ClCs are found in nearly all organisms, with members in every mammalian tissue, yet relatively little is known about their mechanism or regulation. It is clear, however, that they are fundamentally different in molecular construction and mechanism from the well-known potassium-, sodium-, and calcium-selective channels. The medical importance of ClC channels - four inherited diseases have been blamed on familial ClC dysfunction to date - highlights their diverse physiological functions and provides strong motivation for further study. The ClC-type Cl- channels make up a single protein family [1,2,3,4]. They are completely unrelated in sequence to the known cation channels or to other known anion-conducting channels, including the cystic fibrosis transmembrane conductance regulator (CFTR) chloride channels, porins, and ?-aminobutyric acid (GABA) receptors. The family is evolutionarily ancient, with members described in all living kingdoms (Figure 1). Broad sequence identity among ClC homologs is limited to a few highly conserved stretches of amino acids, 'hot spots,' distributed throughout the protein. Overall sequence identity between family members from different kingdoms is 15-20%, but in the hot spots, sequence identity is much higher, with nearly identical amino-acid sequences even in widely divergent species (Figure 2). Overall patterns of hydrophobicity are also strongly conserved in all known ClCs (see below). ClC family tree. Prefixes: h, human; r, rat; ara, Arabidopsis; t, Torpedo. 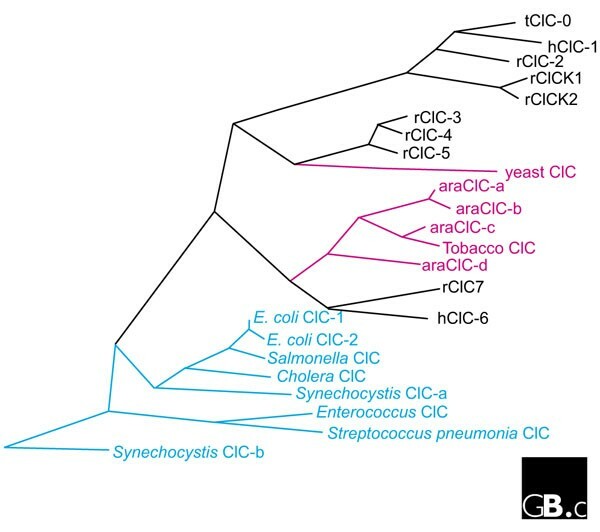 Note that the mammalian ClCs fall into three subfamilies, and that all the higher plant ClCs are closely related to one another. Blue, prokaryotic; black, mammalian; pink, plant or fungal. The tree was constructed with the program Megalign (DNASTAR); the branch lengths are proportional to sequence distances. (a) Transmembrane topology and (b) conserved sequences of the ClC chloride channels. The topology of transmembrane helices 4-7 is currently unresolved; two models, based on conflicting experimental results [1,9], are indicated. Transmembrane helices 9-12 form an extensive, almost uninterrupted, hydrophobic region that crosses the membrane either three or five times. In (b), identical residues are shaded gray, and colors are as in (a). The ClC genes in prokaryotes are known only from genome sequencing projects: their existence had not been anticipated from microbial physiology or biochemistry. Roughly half of the sequenced prokaryotic genomes encode either one or two ClC genes, and, with the exception of the Escherichia coli ClC , nothing is known about these beyond their predicted protein sequences. Yeast (Saccharomyces cerevisiae) has a single ClC, denoted GEF1. Higher plants, typified by Arabidopsis, express multiple closely related ClCs. Animals, including mammals, express three ClC subfamilies (Figure 1). The encoded channel proteins within each subfamily are quite closely related, with protein sequence identities in the range 50-80%. In contrast, sequence identity between subfamilies is almost as low as that between ClCs from different kingdoms (about 20%), suggesting that the subfamilies diverged early in the history of the animals. Indeed, the Caenorhabditis elegans genome contains sequences coding for members of each mammalian subfamily. In mammals, the ClC chloride channel family consists of nine known members (Figure 1) . The human genes for these channels have been mapped and are distributed among six chromosomes . The members for which the intron/exon structure is known contain 10-23 exons. Three of the genes, ClCNKA, ClCNKB, and ClCN6, map to the same chromosomal region, 1p36. Bartter's syndrome, an inherited disorder, has, in some cases, been shown to result from unequal crossing-over of ClCNKA and ClCNKB . The ClCs are a-helical membrane proteins , predicted to traverse the membrane 10-12 times. Both the amino- and carboxy-terminal domains (which are approximately 50-130 and 170-420 amino-acid residues long, respectively, in the mammalian homologs) are cytoplasmic. The transmembrane topology of the core sequence has been mapped using a variety of experimental techniques , which have identified 10-12 transmembrane crossings. The crossings do not correspond directly to the 10-12 transmembrane spanning helices initially identified by hydropathy analysis, however. Moreover, experiments have yielded conflicting results, so the precise topology remains uncertain; nevertheless, the original numbering of helices from hydropathy analysis has been maintained. Transmembrane helices 9-12 contain a particularly hydrophobic stretch of sequence that must cross the membrane either three or five (not four) times. Two proposed models of ClC topology [1,9] are shown in Figure 2. Figure 2 also highlights the hotspots of sequence conservation among the ClC homologs. These hotspots are scattered across the transmembrane regions, a finding congruous with the idea of an 'active site' composed of residues originating throughout the protein sequence (see below). The carboxy-terminal cytoplasmic regions do not contain any hotspots; in eukaryotes, however, these sequences are predicted to contain two 'CBS domains', small domains of unknown but probably regulatory function [10,11]. These domains are found in a wide variety of proteins, including Mg2+ transporters, a protein kinase, and the domain's namesake, cystathionine ß-synthase. The structure of the CBS domain from inosine monophosphate dehydrogenase (IMPDH) has been solved . This domain, which is not required for the catalytic activity, is a dimer that sprouts off the major domain, away from the center of activity. There are no known partner proteins associated with the ClC channels, and it is clear that at least one family member acts alone. ClC-0 chloride channels can be reconstituted from electric ray (Torpedo) electric organ membranes into planar lipid bilayers. Purified ClC-0, from either native membranes or heterologous expression systems, is a single polypeptide that forms chloride channels indistinguishable from those observed in native membrane preparations. Other family members have not been studied as intensely as ClC-0, so it is possible that partner proteins remain to be discovered. Structurally, the ClC channels are unique: they are two-pore homodimers [13,14]. Although other models have been proposed , our recent direct structural data - a medium-resolution projection image from two-dimensional crystals of a bacterial ClC homolog - support the two-pore homodimer model . In contrast, all other known a-helical ion channel proteins form one-pore oligomers of four-, five- or six-fold symmetry, where the pore occurs at the axis of symmetry of the oligomer (Figure 3). The two-pore homodimer construction dictates some basic features of the ClC channel. First, the pore-lining residues must necessarily arise from multiple regions in the primary sequence. Second, the pores must be off the axis of symmetry. In contrast to the one-pore oligomeric channels, therefore, the ClC pore is not constrained to be perpendicular to the membrane. Unfettered by the demands of symmetry, the ClC pore is unlikely to take a straight path through the protein; rather, it may bend or twist. Features of the projection structure  have been interpreted to support such a hypothesis (Figure 4). 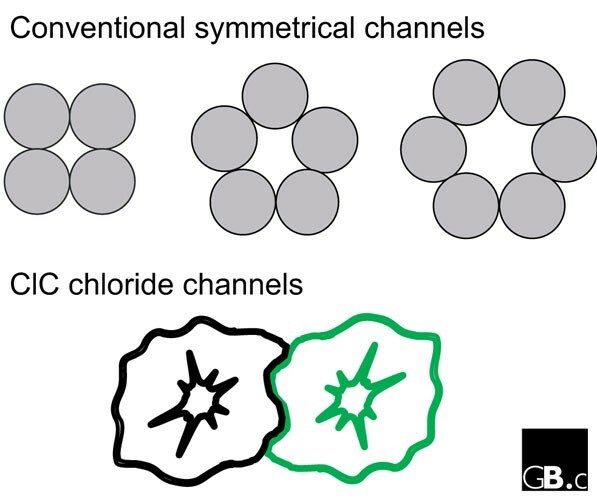 A comparison between the molecular design of all known a-helical ion channel proteins and that of the ClC chloride channels, viewed from above the plane of the membrane. The conventional channels form pores between the symmetrically arranged subunits, along the axis of symmetry of the oligomer. Although the ClC channels have a two-fold axis of symmetry between the two ClC subunits, the pore is not on this axis; it is formed off-axis, within a single subunit, and hence with no symmetry. Projection structure of a bacterial ClC-type chloride channel, determined from cryoelectron microscopy of two-dimensional crystals . High density (protein) appears yellow or white, whereas low density (water) appears dark red or black. The two pairs of high-density regions in each dimer probably represent part or all of the two aqueous pores in each protein complex. Reprinted with permission from . Much of what we know about the physiological function of ClC channels comes from human genetic diseases. ClC-1, which is largely expressed in skeletal muscle, is mutated in inherited myotonias in humans, goats, and mice ; this association was critical in establishing ClC-1 as the major ion channel involved in setting and restoring the resting membrane voltage of skeletal muscle. 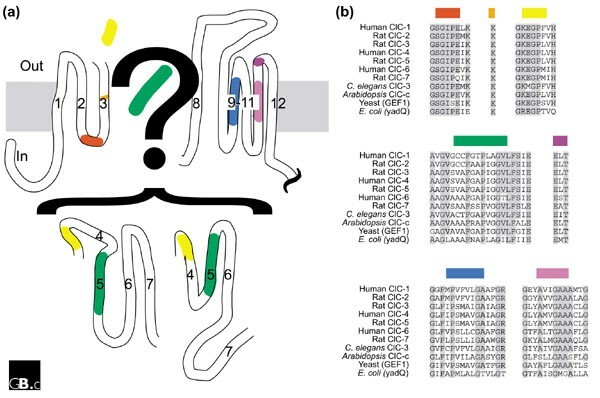 Similarly, identification of ClC-Kb mutations as a cause of Bartter's syndrome, an inherited salt-wasting nephropathy, demonstrated that this channel is a critical component of the urinary concentrating mechanism in the kidney . ClC-Ka has also been suggested to play an important role in urinary concentration, as mice with the gene 'knocked out' have nephrogenic diabetes insipidus . Recent work suggests that the abnormalities in patients with Dent's disease, a pleiomorphic disorder of renal solute re-uptake caused by inherited mutations in ClC-5, result from defective endocytosis in the renal proximal tubule . ClC-5 is mostly localized to intracellular compartment membranes, as is ClC-4. These observations support a hypothesis in which ClC-5 serves as a 'Cl--shunt' in endocytic vesicles, allowing acidification without prohibitive charge separation across the vesicular membrane. GEF1, the yeast ClC, has been suggested to play a similar role . Indeed, GEF1 shares more sequence identity with the mammalian subfamily containing ClC-5 than with any other subfamily (Figure 1). Although the physiological function of many other ClCs remains unknown, several do have proposed functions. ClC-2, which is expressed in all mammalian tissues, has been proposed to play a role in the cellular response to volume/osmotic stimuli . In addition, this channel has been co-opted in some neurons to modulate their electrical excitability . ClC-3 is also apparently activated by osmotic changes in the environment, via phosphorylation dependent on protein kinase A ; recent experiments have suggested, however, that these volume-sensitive currents are due to endogenous, non-ClC, chloride channels . Regulatory mechanisms applying to other ClCs remain obscure, as do the physiological roles of the other family members. All ClCs that have been studied form pores that are selective for chloride ions over large organic anions and are not measurably permeant to cations. The molecular details of the ClC channel pore are unknown. Presumably, many of the pore-forming residues will be conserved, so a logical place to look for pore-lining residues is in the hotspots shown in Figure 2. Fahike et al. have demonstrated that mutations in one of the hotspots (the carboxy-terminal end of the D3 transmembrane domain, GKEGPFVH (in the single-letter amino-acid code) in ClC-1) have significant effects on channel selectivity. In addition, they used cysteine-scanning mutagenesis to argue that these regions are accessible through aqueous pathways extending from both sides of the membrane . They thus proposed that these residues form part of a 'selectivity filter' lining the channel pore. Given the asymmetric nature of the ClC pore (see above), such a selectivity filter would require residues from other parts of the protein. Indeed, mutations in many regions of the protein affect ion permeation. All of the studied ClC pores are gated (opened and closed) by transmembrane voltage. This voltage-dependent gating, unlike that of the cation-selective channels, is an extremely malleable characteristic. The magnitude and even the direction of the effect varies strongly between homologs, even within the same subfamily. For example, ClC-1 closes in response to hyperpolarizing (negative) membrane potentials, whereas ClC-2 opens. ClC-0, which closes with hyperpolarization, adopts the opposite voltage-dependence when mutated at various seemingly unrelated regions of the protein. The structural features behind this variability are completely unknown. Some ClCs are gated by other factors in addition to voltage: pH (ClC-0, -1, -4, and -5), cell-swelling (ClC-2 and -3), or phosphorylation (ClC-3). Again, the molecular mechanisms underlying these actions are not known. Single-channel analysis is the most powerful tool for scrutiny of ion-channel mechanisms. Only one member of the ClC family, ClC-0, has been studied in detail at the single-channel level . These studies have provided a clear description of several unique features of this channel. First, ClC-0 displays two separate voltage-dependent gating processes. One of these, the 'slow gate,' acts on both pores simultaneously, promotes opening of the pores at negative (hyperpolarizing) voltages, and occurs on the timescale of seconds; the second, the 'fast gate,' occurs independently in each pore, promotes closing of the pores at negative voltages, and occurs on the timescale of milliseconds. The voltage-dependence of the second mechanism arises from movement of the permeant chloride ion across the transmembrane voltage, another unique feature of the ClC family. Details of the molecular mechanism of ClC channel function will be best studied in the light of a high-resolution molecular structure. 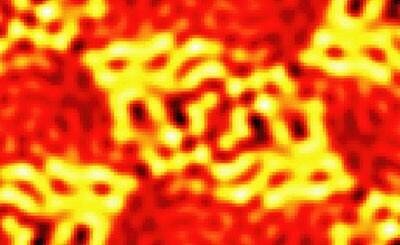 The two-dimensional crystals from the E. coli ClC diffract to 4 Å resolution (our unpublished observations), and so such a structure is imminent. The big gap in knowledge is thus the function of the prokaryotic channels. Although radioactive flux measurements demonstrate that the E. coli ClC is a chloride channel, these types of measurements do not match the mechanistic detail provided by electrical recordings. Such recordings are needed to answer basic questions. Are the prokaryotic channels voltage-dependent? (Two of the three eukaryotic subfamilies are; the third has not been studied.) Are they gated by any of the other known mechanisms, or by a new mechanism? What is their precise selectivity? Knowledge of these mechanistic details will, together with high-resolution structure, provide a foundation for understanding how these proteins work. Understanding of the physiological roles of ClC channels is also incomplete. Gene knockouts (in the form of human genetic diseases) have been essential for determining the physiology of several ClCs. Similar knockouts in model systems promise to shed light on the functions of other family members. In fact, results published while this article was in press [26,27] provide startling insight into the physiological function of the ClCs. Surprisingly, knocking out ClC-3 had no effect on volume-regulated Cl- currents , but, even more surprisingly, the knockout mice suffered complete degeneration of their hippocampi. The ClC-3 channel localizes to intracellular vesicles in this region of the brain, and its inactivation impairs acidification of synaptic vesicles. Similarly, mutant mice (and humans) lacking the ClC-7 gene display defects in pH regulation ; they suffer severe osteopetrosis, a disease that results in brittle, breakable bones, because of a defect in the Cl- shunt in osteoclasts - cells involved in bone remodeling. The clear theme emerging from the ClC knockout mice is that ClCs in the ClC-3/4/5 and ClC-6/7 subfamilies play important roles in regulating pH in intracellular compartments. It is still poorly understood why knockouts of these genes, whose products are broadly distributed, result in such specifically localized defects. The role of compensatory mechanisms in these knockouts has yet to be explored.